While world population increased 72 percent between 1970 and 2004, extraction of construction materials grew by 106 percent. The total consumption and extraction increased for practically all mineral resources – despite the buzz about decoupling the economy from natural resources use. In many countries of the world, a dramatic increase in extractive activities followed the adoption of neoliberal economic reforms with the promise of more economic growth. Against this background, this report explores contemporary mining conflicts at the crossroads of de-growth and environmental justice movements. This is done based on 24 real case studies from 18 different countries in 5 continents. The analysis helps us understand the links between mining conflicts, the quest for economic growth and the metabolism of economies as well as the role of ecologically unequal exchanges. All of these cases are directly chosen and reported, either in factsheet or in-depth study format, by Environmental Justice Organisations (EJOs), as part of a well-established knowledge sharing activity in EJOLT between EJOs and the academic community. The justice claims they make are broad and diverse, encompassing distributional concerns, recognition of rights and participatory claims. While these claims are in many ways integrated and overlapping, deciding which dimension(s) of justice is more relevant in a particular case or at a particular time should be the strategic decision of the opposition movement. 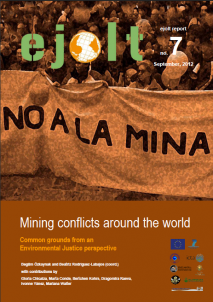 Environmental Impact Assesment (EIA) – related controversies are very common in mining conflicts. EIAs are neither well prepared by businesses nor well reviewed by governments and EJOs are often able to make strong arguments against their validity. Collaboration with experts and science has strengthened and legitimised justice movements in several cases but the consultation period should be extended to the allow time to revise the EIA in an appropriate manner. Experts should be used systematically to revise each part of the EIAs and a shortlist of specialists for each part should be prepared in consultation with other ministries and CSOs. A comparative study of rehabilitation funds in other countries—how and by whom are they managed, how much is earmarked beforehand, etc.—should be carried out by independent consultants with recommendations. It is crucial to consider the “zero” alternative of no mining development, the economic and social constraints that the investment will impose, and the scope of these constraints in careful detail. Many illegal mining operations need to be suspended. In mining conflicts the problem is not always one of “cleaner production” or “environmental standards” but more of recognition of rights. As in other social movements, recognition as a legitimate partner in the debate is as important as the distributional outcome. Keywords: activism, case-studies, commodity frontiers, development, environmental justice, externalities, liabilities, mining conflicts, participation, recognition, resource extraction, sustainability.